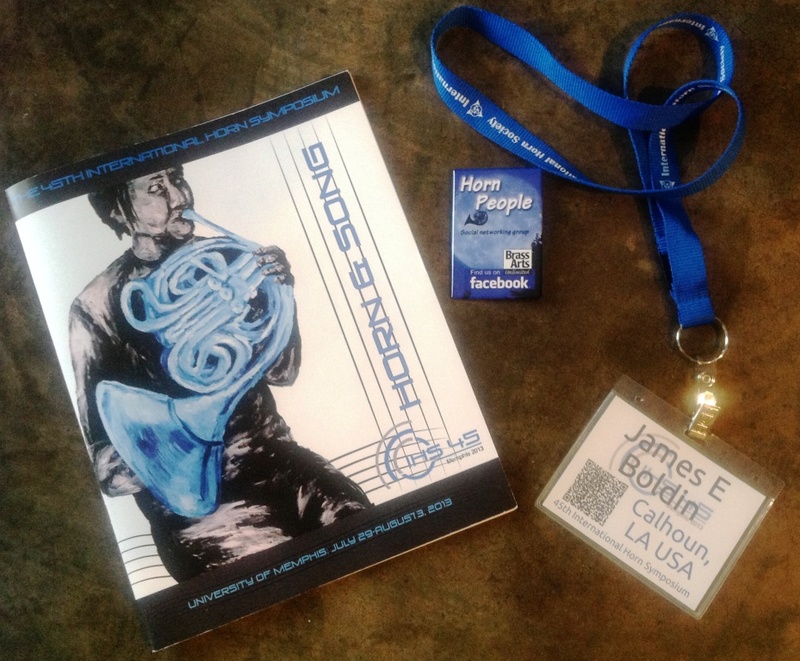 I returned yesterday from the 45th International Horn Symposium, hosted by Professor Dan Phillips at the University of Memphis. First, hearty congratulations and a huge thank you to Professor Phillips and his students for putting on a fantastic symposium this year! Though there are similarities among all events of this type, each has its own unique feel and style. The overarching theme of “Horn and Song” provided a sense of unity and cohesion to virtually all of the activities. My experience this year was a bit condensed – I arrived on Wednesday evening and departed on Saturday morning – but I still got to attend several different types of lectures and concerts, as well as peruse the exhibit rooms. It’s impossible to attend everything at such a large conference, but I tried to make sure that I saw a cross section of what was happening. As my time was rather limited this year I decided to wait until returning home to post some thoughts about the symposium. Thursday afternoon’s Artist Recital featured Jasper de Waal and Abel Pereira (visit the IHS 45 Featured Artists page for more info), in a program of music by Ignaz Lachner, Paul Basler, and Johannes Brahms. Mr. Pereira, an internationally known player from Portugal, opened the concert with Lachner’s Concertino, Op. 43 for Horn and Bassoon, followed by Paul Basler’s Six Bagatelles for Horn and Bassoon. I was very impressed with Pereira’s playing, which combined technical prowess with consummate musicality. The second movement of the Lachner was especially gorgeous. Collaborating artists Lecolion Washington on bassoon and Tomoko Kanamaru on piano were equally impressive. Jasper de Waal, former Principal horn with the Royal Concertgebouw Orchestra, performed the Brahms Op. 40 Trio on the second half. I’ve heard this work performed numerous times by world class artists, but de Waal’s rendition was absolutely mesmerizing. His sound has a buoyancy and effortlessness which leaves the listener wanting more. Musically there were some interesting interpretations of this well known work, but they were presented with such confidence that the audience couldn’t help but be convinced. de Waal and his colleagues So-Hyun Altino on violin and Victor Asuncion on piano received a well deserved standing ovation. After a short sound check and dress rehearsal with my colleagues on Thursday evening, we were ready for our Friday morning performance on one of the Contributing Artist recitals. Our work, Eurico Carrapatoso’s Sete Melodias em Forma de Bruma for soprano, horn, and piano, is not well known, but our performance went well, and we got several positive comments after the recital. Thank you and bravo to my colleagues Claire Vangelisti and Richard Seiler for joining me in this performance. Friday afternoon’s Artist Recital had a very interesting lineup. Bruce Richards of the Liège Philharmonic performed the first three works on the program on Wagner Tuba. He played two new works composed for him by students at the Liège Conservatory, as well as a rare piece by Jan Koetsier for Wagner Tuba and string quartet. Richards sounded fantastic, negotiating what would have been very difficult writing even for the horn with grace and finesse. The concert also featured several other new pieces, including the premiere of a horn quartet by James Naigus (Beale Suite), a trio for Horn, Violin, and Piano by Eric Ewazen, and Three Hunting Songs for Horn Quartet and Voice by Brian Holmes. Although the program was lengthy (over 2 hours), the performances were engaging and well executed. The concert on Friday evening was a real highlight of my trip to IHS 45, with stellar performances from Abel Pereira (premiere of a new concerto by Luís Tinoco), Jasper de Waal (Mozart Concerto, K. 447), and Frank Lloyd (Britten Serenade). In addition to these major solo works, the audience was treated to some fine ensemble playing in Rossini’s Overture to Semiramide (horn section led by Jeff Nelsen), the famous “Abscheulicher” aria from Beethoven’s Fidelio (horn section led by Jon Boen), and Benjamin Britten’s horn quartet In Memoriam: Dennis Brain (Four Hornsmen of the Apocalypse). Kudos also to the Eroica Ensemble and their conductor Michael Gilbert (father of NY Philharmonic conductor Alan Gilbert) for providing the orchestral portions of the program. Although I wish I could have attended more concerts – especially some of the Contributing Artist recitals – I was both impressed and inspired by the performances I heard. This year I spent most of my exhibit time looking at music, especially teaching materials, solos, and chamber music. Here’s a quick rundown on what I picked up. Fernando Morais, Brazilian Short Studies for Brass Instruments: A collection of etudes and duets based on Brazilian folk music, which I plan to use to spice up duet playing in lessons. William Presser, Three Pieces for Solo Horn: I hadn’t heard of this solo work, but it was frequently performed by Marvin Howe, and has been recorded by Randall Faust. Marvin Howe, The Solo Hornist: Arrangements of well known tunes for horn and piano, with accompaniment CD. I’m always looking for short, lyrical works to help fill out recitals and to recommend to students. Susan Salminen, Fanfare for Horn and Timpani: I heard this work on a recording by Kent Leslie, and thought it might make a nice addition to my upcoming recital of music for horn and percussion. Edward Troupin, Divertimento for Trumpet, Horn, and Trombone: New piece to read in our faculty brass trio. Looks very interesting! I didn’t try any horns this time around, but there was the usual assortment of horns and accessories, showcased by exhibitors from all over the world. One of the newest products was a case by Wiseman of London. Though this is their first attempt at a horn case, Wiseman is a leading name in cases for all types of musical instruments. Their product looks incredibly well made, and the craftsmanship is evident in every component of the case. Buying one of their cases would be a considerable investment, but given the high (and rising) cost of horns, the price of protection for one’s instrument might just be worth it. Their cases also come with a lifetime warranty. My only concern with this case would be if it could actually fit in the overhead bins or under the seat of a very small aircraft, like the Embraer ERJ 145. I’ve flown on these jets quite a bit, and they are very cramped. To round out my visit, I attended two lectures, presented by John Ericson of Arizona State University, and Tiffany N. Rice Damicone, recent Doctoral Graduate from Ohio State University. You can read a brief overview of Dr. Ericson’s presentation at Horn Matters (A Masterclass with Philip Farkas on Musicianship), but I will add that it was really cool to see some rare video footage of one of the icons in the horn world. Thanks to Dr. Ericson for sharing this great resource! Dr. Damicone’s lecture was equally interesting, and was based on research conducted for her dissertation, “The Singing Style of the Bohemians” – A Study of the Bohemian Contributions to Horn Pedagogy, Western Perspectives on Czech Horn Playing and Analysis of the Teachings of Zdenek Divoky’ at the Academy of Performing Arts (D.M.A. diss., Ohio State University, 2013). Her presentation was well organized and delivered quite effectively. The handout from the lecture lists several little-known Czech resources which I look forward to exploring. That about does it for this report. If you’ve read this far then you were probably at the symposium anyway, but if you weren’t I hope that this summary inspires you to attend a future horn workshop or symposium (next year’s symposium will be in London). They really are special events, and every horn player should attend at least one of them. I’ll close on a bit of a personal note by saying that I truly enjoyed reconnecting with friends and colleagues at IHS 45, including some friends from graduate school that I hadn’t seen in several years. Let’s keep in touch! Where can I find Howe, The Solo Hornist? Thx! Fernando Morais it’s a great composer, he has some of his works published at the International Horn Society Website. Check his 20 etudes and his horn and piano pieces. He has a lot of works including a recently premiered horn concerto.